Mario and Luigi are celebrating Princess Peach's birthday in her castle when Bowser Jr. and the Koopa Kids jump out and kidnap Peach. Mario, Luigi and two Toads give chase. 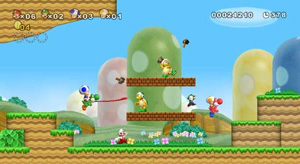 New Super Mario Bros. Wii is the first game in the series to feature simultaneous multiplayer gameplay for up to four players. Stomp the enemies, grab power-ups (including Yoshi) and hit the flagpole to clear each stage. Players can work together or compete for items. Also new is the Super Guide, allowing novice players who lose eight lives in the same area to let the CPU clear the stage for them. The secret World 9 only opens after you beat the game, and the map shows it is set on a giant Rainbow Star. 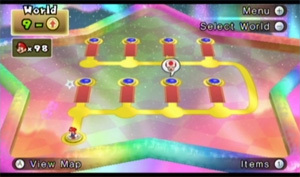 The map music contains part of the Rainbow Road theme from Mario Kart 64 (and later Mario Kart games). 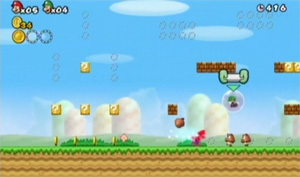 The second Coin Battle stage is based on World 1-1 from Super Mario Bros. There have been many secret areas added to the stage where Coins have been hidden, and parts of the level change shape as you approach.